"Blue" is a 12 year old Irish Sport Horse. 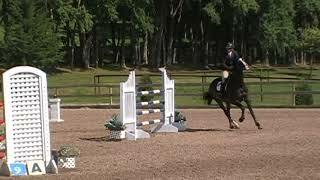 He is an athletic and scopey jumper that has competed in several Regional Standard Grand Prix's as well as many Junior/AO classes. He is very handsome, kind, and quite the fun ride. He would be an excellent mount for a Junior or Amateur to gain valuable experience over some larger fences. He would be ideal in the High Ch/AA (1.10m-1.15m) to Med Jr/AO (1.30m) range.